Once described as “an architectural wonder” by Architectural Digest, the traditional nomadic home of Mongolia and surrounding regions, typically referred to as a Ger, has been widely used for thousands of years. 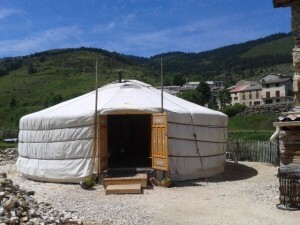 Key factors in defining a yurt are that it is portable, circular, has an accordion lattice wall, a tension band, radial rafters leading up to a central compression ring and is covered in felt or fabric. Our respect for the ingenious, practical design of this amazing structure inspired us to establish the first modern yurt company. There are several variations of the basic design and different names used for the structure. Of these variations there are two main types, the Ger and the bentwood yurt (also known as the Üy). The Mongolian Ger is the older design, which has a relatively heavy center ring (known as the crown or tono) and straight rafters (known as uni) spanning from the center ring to the lattice wall (known as the khana). This is the design that the modern Pacific Yurt was inspired by and patterned after. 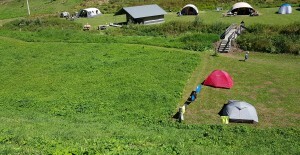 on our campsite you can stay on one off the six places, in our own rentingtent sibley or in one our lodge safaritents. you can stay here in all freedom , the bathroomblock is few steps from the dampsite and are new. a fully completed living area with kitchen,tv,readingcorner, and fireplace is for the campsite guests .Breadservice every morning even meals are possible to take away. to shop you have a big grocerry in 5 kms. on the campsite you have free wifi and in the restaurant you have a free acces to a computer. ‘Glamping’, adventurous and glamourous camping in one of our luxury furnished safari tents. A luxury safari tent with an attractive wooden scaffolding decor! Discover the new Safari tents and experience the new glamping at Camping le silence du midi. The Safari tents have 4 beds, loung sofa, table with 6 chairs, kitchenette with refrigerator, kitchen inventory. The Safari tents can accommodate up to 6 people. We offer you a stay at one of our 3 apartments / studios. Upon request half pension can be arranged. All flats are equipped with kitchen, sitting room,ipad, shower, sink, toilet, terrace and one or two bedrooms. Water usage, bed and bath linnen and final cleaning are included in the price. 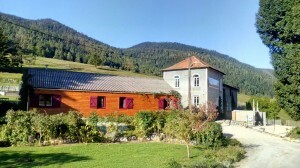 For a stay in a typical chalet in the Pyrenees we have the following to offer. 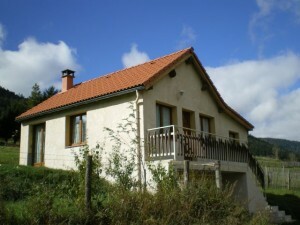 A fully equipped and decorated chalet for 4 to 5 persons and a large private garden. A tasteful furnished dining and living room with a nice and cosy fire place. The kitchen is fully equipped and the bathroom has a shower and a washing-stand. 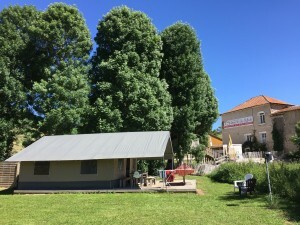 The chalet, at the edge of our domain, gives you the possibility to stay at a half pension rate. If you want, the meals can even be brought at the chalet. The rent includes all linen (bed, bathroom and kitchen) and the cleaning after your stay,Firewood is always present. Underneath the chalet, there is a garage, where the firewood is to be found as well. Pets are not allowed !! It is also forbidden to smoke in the chalet. One week’s rent (7 nights) is 450euro + 0.10€ per kwh electrity.